﻿With ever increasing electricity costs, Solar energy systems are proven to dramatically reduce your power bill, not just immediately but for many years to come. CDA have been providing Solar for over 10 years and offer a range of Solar Energy and Solar Hot Water Solutions to suit your household, and budget. Our experts can provide you with the facts about Solar and provide recommendations of how best to invest in your future. At CDA we won't sell you obscure brands with questionable warranties and poor performance, we only sell high-performing quality products from global manufacturers who have a strong Australian presence. We want the products we sell to last and for them to pay back your investment as quickly as possible. ﻿﻿﻿﻿﻿﻿﻿CDA supply market leading solar technology to provide a range of systems to suit both residential and commercial needs. 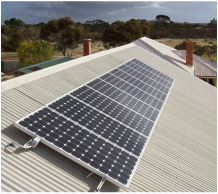 All systems are supplied, installed and serviced by our team of CEC qualified Electricians and installers so as to provide our community with a high performance, reliable and cost-effective solar solution. This is where our experts can help. We visit your property, talk to you to understand your electricity usage so as to size and recommend a Solar Energy system tailored to your needs. Where to install? - North facing is best but East and West can provide a better spread of power feed. Try to avoid shaded areas if you can, if you can't then micro-inverters or optimisers might be better..
How much room do I have on my roof? - This will dictate the size of system you can install or what panel size you need. How much power do I actually use during daylight hours? - If you use little power during the day then Solar may not be for you. What is my budget? - Larger systems cost more so how much can I afford and does Solar make financial sense. How long will I live in my house? - If you are thinking of moving in the next 10 years then will a cheaper system actually add to the value of my property? How large a system can I install? - Generally up to 3kW is fine, larger systems will require assessment and approval from Western Power. We can help here. With Solar, while the sun is shining you will be generating electricity, if you are using electricity at this time then it is essentially free. Solar Energy systems can pay for themselves within 3 years, so thereafter the electrical power generated will be free. Battery storage technology is now available and you can retro-fit a battery to any existing Solar PV system. At the moment though battery storage is expensive and a battery system will take more than 9 years to pay for itself. Technology is ever-changing and prices of batteries are gradually falling, it's only a matter of time before battery storage becomes attractive. No matter what, battery storage for our homes is the future. Everything you need to know about solar systems, the benefits, their components and how to get started.